We can arrange for you to get married in our Catholic church with all standard procedures that would follow in your local church ceremonies. 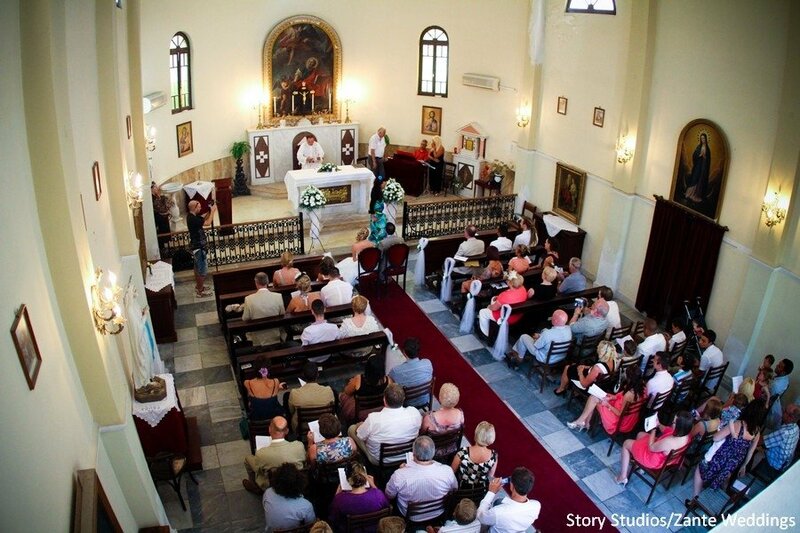 Our Catholic church in St Markos square is in a picturesque location in the heart of Zakynthos town. The guests have been seated comfortably while they wait for the appearance of the bride. The groom and the best man are pacing in anticipation. The decorated bridal car will bring the bride, the father and the bridesmaids. As it pulls near, the traditional beeping of the horn announces the bride’s arrival. Everyone takes their places. We carefully help the bride out of the car, and give father-daughter a moment to exchange their last words. As her dress is fluffed, we double-check all the tiny details, and have a few photos of them before we proceed. As they arrive towards the church the videographer makes sure that all the emotions are recorded on film. The church is discreetly decorated to give a nice formal appearance. On either side of the alter, we have two stands with colourful fresh flowers matching the brides bouquet. Along the aisle we have entwined tulle with a small handful of flowers to enhance the atmosphere. At the alter, the groom waits for his lovely bride to reach him. As she makes her appearance through the wooden doors as the wedding march is played. The father gives his daughter away with a small kiss. The soon to be husband and wife exchange their glances as they sit down and await the ceremony to begin. Our English-speaking priest will begin by introducing himself and making everyone feel at home. The ceremony may take from 30 min to an hour depending on what you would like to be included. You may take communion, light the candle or exchange your coin, just to mention a few of your traditions. You may have family members read scriptures, poems or even sing something dedicated to this holy event. The three-member chorus will give a special note to the ceremony with their lovely hymns. Many photos are taken outside on the steps of the church with family and friends. The last photos are taken inside the church with the couple being surrounded by the lovely fresh flowers. In the square, a decorated table that holds the champagne tower has been arranged for you. (a nice thirst-quenching idea to add a little bit of frill to the event.) As the bride and groom hold a bottle each and try to fill the top glasses carefully, the remaining glasses below welcome the overflow. Helping themselves to a drink, the guests cheer on the newly married couple. As everyone is mingling with their “bubbly”, the surprising arrival of our decorated horse and carriage leaves all speechless. The groom helps his bride into the carriage as they smile and kiss for the photos that are taken. A few moments later, they vanish into the sunset leaving their guests behind to wonder what other surprises are due to follow later that evening. Our professional wedding coordinator has arranged for the guests to be transferred by bus to the reception. There they are welcomed with drinks as they await the arrival of the bride and groom. Meanwhile, the couple arrives at the reception by horse & carriage. A series of beach photos are taken to add to their album. Along with your coloured photos you can choose to have a variety of black/white and/or sepia . During the wedding reception our Greek live band with our professional Greek dancers will entertain your guests. After dinner the cake is traditionally cut accompanied by your first dance. Our DJ will continue till the wee hours of the morning with your favorite tunes. Your guests will talk about this event for many years to come.